I saw a post on the ChessPro guestbook: «If Topalov now ends four games in a draw, then he will get his first place, or share it with Svidler». I did not try to find if someone as meticulous as me has corrected this person: one of this draws will be in the game with Svidler, so this result provides him with a clear first place. To tie for the first, Veselin has to lose to Peter. He can win against Judit, and then, in case Peter wins three remaining games, they will share it. One could proceed with such speculations, but what is said is enough to understand that there is no sports interest in this event. Only creative delights are left for us. In round 10 two «Spanish» encounters did not give any adrenaline, so in the centre of attention were the games of the leader and the outsider. The latter has strengthened her outsider position, and the leader was close to surpassing incomparable Judit Polgar by 6 points after 10 rounds. And by the way it is a nice entertainment: we can start counting out «drowned people» – with four rounds to go, Polgar and Adams lost their chances to catch up with Topalov. Let us see who will follow them after the 11th round. The Topalov-Morozevich game will be thoroughly analyzed by Sergey Shipov who has been provided with impression from evening till late at night (this sentence arose because of the report I saw long ago on Soviet TV. After the concert on some factory an official said something like, «We should notice that comrades actors often come to our workshops and provide us with pleasure». So I will also use this charming phrase...) In spite of mutual mistakes, the game kept the tension, and the players provided numerous people who gathered in playing zones with the same thing that aforementioned actors provided Soviet workers with. 1.e4 c5 2.¤f3 d6 3.d4 cxd4 4.¤xd4 ¤f6 5.¤c3 a6 6.Ґe2 e6 7.a4 Ґe7 8.0-0 ¤c6 9.Ґe3 0-0 10.f4 Ґd7 11.¤b3 b6 12.Ґf3 Јc7 13.g4 Ґc8 14.g5 ¤d7. The Ґc8-d7-c8 maneuver became well-known after the epochal 24th game of the world championship match in 1985. Let us do the following: I will cite the text just in case, and will show the differences and similarities between the pictures myself, in order to spare the reader's effort of using two separate chess sets. 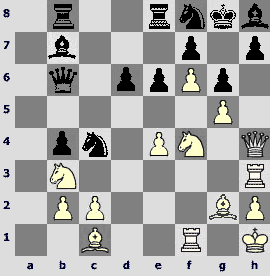 Karpov-Kasparov: 1.e4 c5 2.¤f3 d6 3.d4 cxd4 4.¤xd4 ¤f6 5.¤c3 a6 6.Ґe2 e6 7.0-0 Ґe7 8.f4 0-0 9.ўh1 Јc7 10.a4 ¤c6 11.Ґe3 ¦e8 12.Ґf3 ¦b8 13.Јd2 Ґd7 14.¤b3 b6 15.g4 Ґc8 16.g5 ¤d7 17.Јf2 Ґf8 18.Ґg2 Ґb7 19.¦ad1 g6 20.Ґc1 ¦bc8 21.¦d3 ¤b4 22.¦h3 Ґg7 23.Ґe3 ¦e7 24.ўg1 ¦ce8 25.¦d1 f5 26.gxf6 ¤xf6 27.¦g3 ¦f7 28.Ґxb6 Јb8 29.Ґe3 ¤h5 30.¦g4 ¤f6 31.¦h4 g5 32.fxg5 ¤g4 33.Јd2 ¤xe3 34.Јxe3 ¤xc2 35.Јb6 Ґa8 36.¦xd6 ¦b7 37.Јxa6 ¦xb3 38.¦xe6 ¦xb2 39.Јc4 ўh8 40.e5 Јa7+ 41.ўh1 Ґxg2+ 42.ўxg2 ¤d4+. White resigned. So, in the great predecessors' game the g-pawn advance and subsequent retreat of the f6-knight occur on the 16th move, while in the present game it happens on the 14th move. And if we put the white queen on d2, and the king on h1, and black rooks – on b8 and e8, then we will get a clone. 20 years of practice have shown that there are more rational move orders for White. 16...Ґf8. 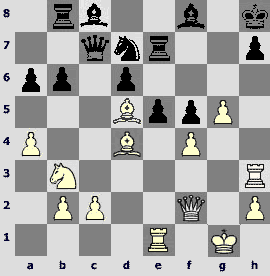 Recent Alekseev-Golod game (Biel, 2005) ended in a draw after 16...¤a5 17.¤d2 Ґb7 18.¦h3 g6 19.Јg4 ¦ac8 20.¦f1 ¤c4 21.¤xc4 Јxc4 22.¦d1 ¤f8 23.Јh4 d5 24.Ґd4 Ґc5 25.Јf2 dxe4. This was cited just to prevent you from the idea that Black is doomed to follow the standard that was worked out once and forever. 17.¦h3 g6 18.Јe1 ¤b4. One more opening reference, this time not the fresh one: Kirov against O.Popovich (Hamburg 1977) defended successfully after 18...Ґg7 19.Јh4 ¤f8. 19.Јf2 ¦b8. Nothing awful happens if I suggest an alternative of 19...Ґb7. 20.¦f1. 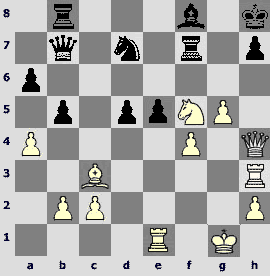 It is a bit too early to go rightwards – 20.Јh4 h5 21.gxh6 ¤xc2. In this hall a crowd of tourists should stop and listen carefully to a guide's explanation concerning the displayed painting. If we want to go on to the position from the Karpov-Kasparov game here, we should give three free moves to Black – Ґb7, Ґg7, ¦bc8 (it does not matter for the rook where to stand, but the bishops moves are very important! 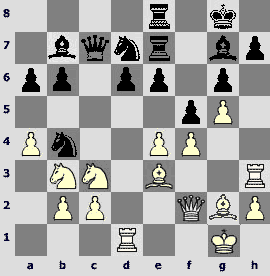 ), and White has a suitable position already, only the king should be placed on h1 (as a matter of fact, it is an absolutely useless prophylaxis in this position). It is clear that Judit has been late to a train somewhere. Or, more accurately, Rustam has passed ahead. Do you remember Gufeld's famous story about threefold repetition, when he suggested marking rooks with crosses? So, Kasimdzhanov has his kingside rook on h3, and Karpov had the queenside one! 20...f5. After 20...Ґg7 21.f5 the dark-squared bishop will be inevitably corked up with the f-pawn, because 21...exf5 22.exf5 gxf5 meets 23.Јh4 with double attack on b4 and h7. Passion for order makes one check another bishop as well – 20...Ґb7 21.f5 exf5? 22.exf5 Ґxg2 23.fxg6, winning (obvious evidence of the fact that there is no need to place the king on h1), and if Black protects the 7th rank, then after Јh4 h5, h5xh6 her kingside turns out to be fairly battered. And now I will tell you an amazing thing. Half move earlier we compared the position with the classic example. Nevertheless... 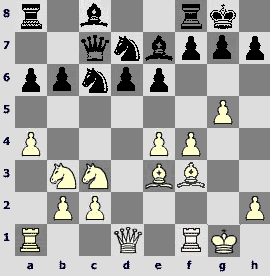 When Kasparov played f7-f5, White had the same position and only the f1-rook was on d1. And Black by some miracle put the bishops on b7 and g7, and doubled the rooks on the e-file! 21.exf5 gxf5 (21...exf5? 22.¤d5 does not suit at all) 22.Ґd4 ¦e7. It is possible that 22...Ґb7 is better. But Judit is an attacking player, and she did not like the prospect of loosing a rook – 23.¦xh7!? (of course, White can consider playing 23.g6! ?, and other less forced moves). Most likely, the idea is incorrect; in parenthesis better defenses for Black are mentioned. But the 7th rank weakness causes anxiety. 23...ўxh7 24.Јh4+ ўg6 25.Ґf3 Ґxf3 (25...e5! 26.Ґh5+ ўg7 27.Ґxe8 ¦xe8 28.Јh6+ ўf7 29.g6+ ўe7 30.Јg5+ ўe6 31.fxe5 dxe5 32.Јxf5+ ўe7) 26.¦xf3 e5 27.¦h3 ўf7 28.Јh7+ ўe6 29.g6 ¦e7 (29...Ґg7! 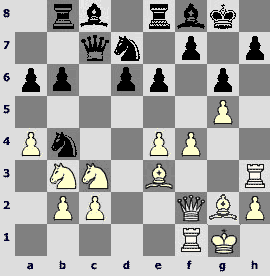 30.Јxg7 ¦e7 31.Јh6 ¦g8) 30.Јg8+ ўf6 31.Ґf2 exf4 32.¤d4 – White attacks enthusiastically. The next insinuating move shows that the cited variation is my dream rather than real players' plan. 23.¦e1! In case of impatient 23.g6 hxg6 Black has a chance to coordinate his pieces – 24.¦h8+ ўf7 25.¦h7+ ўe8, or 24.Јg3 Ґg7 25.Јxg6 ¤f8, or 24.Јh4 Ґb7. One can wake up suddenly and play 24.¦e1, but it would not cause such effect, especially in psychological sense. 23...e5. In case of 23...Ґb7 the previous White's move is fully justified – 24.g6 hxg6 25.¦h8+ ўf7 26.¦h7+ ўe8 27.¦xe7+ Ґxe7 (27...ўxe7? 28.Јh4+) 28.¦xe6. However, this would be a better choice, because after 23...¤c5 24.g6 hxg6 25.Јg3 Black has bad times, and the nervous pawn move could lead to a quick collapse. 26.Ґc3. 26.fxe5 ¤xe5 is simpler (26...dxe5 27.Јxf5 loses immediately) 27.Јf4! (27.g6 ¦g7 was premature, but now g5-g6 hangs like sword of Sophocles, as one educated lady used to say by mistake). After 27...Ґb7 28.Ґxb7 ¦xb7 29.Јxf5 ўg8 White has one good extra pawn, and 27...Ґg7 is unsuccessful because of 28.Јh4 Ґf8 29.g6 ¦g7, and there is a mate everywhere – cold-blooded one after 30.Јf6 and effervescent one in case of 30.Јxh7+! ¦xh7 31.¦xe5! dxe5 32.Ґxe5+! Јxe5 33.¦xh7#. 26...Ґb7. One could stay afloat by 26...b5. If White continues with 27.¤d4, as in the game, then he gets an advantage after 27...b4 28.¤c6! ¤b6 (28...bxc3 29.¤xe7 Ґxe7 30.¦xh7+! ўxh7 31.Јh4+ ўg7 32.Јh6#) 29.¤xb4 ¤xa4 30.¤c6. However, 27...Јc5! leads to an unclear position – 28.¤xf5 Јxd5 29.¤xe7 Ґxe7 30.g6 Ґb7 31.Јg3 ўg8! 27.Ґxb7 Јxb7 28.¤d4. Rustam still wants more comfort than the 28.fxe5 ¤xe5 29.Јxf5 variation suggests. The knight is obviously tabooed. 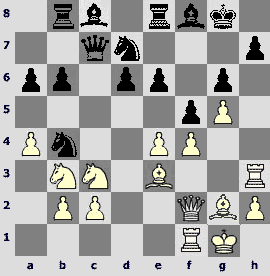 28...¦f7 29.Јh4 b5 (29...exd4 30.Ґxd4+ ўg8 31.g6, winning) 30.¤xf5 d5. 31.g6?! And here it was surely a high time to play 31.fxe5 and to accept resignation. The b6-g6-g1 triangle has such an area that human eye cannot observe it all. And maybe Rustam lost sight of something later in the game. 31...Јb6+ 32.ўh1? (with regard to this question mark see the annotation to the 35th move) 32...Јxg6 33.¦xe5 (33.fxe5 is good again) 33...¤xe5 34.Ґxe5+ Ґg7 (34...ўg8 35.¦g3) 35.Ґxg7+?! Tempting 35.¤xg7 ¦xg7 36.¦g3 will be followed by 36...Јe4+ 37.ўg1 Јe1+ 38.ўg2 Јe2+ with perpetual check (for sure only if White does want to pack his king on h3 or h1). Having time for comparative analysis that we often use in this review, it is easy to see that in case of 32.ўf1! Black does not have the saving queen check from e4. Thus the mark to the 35th move is imposed exactly by this e4-check. It would have been better to initiate the double exchange on g7 by capturing with the knight. 35...¦xg7 36.¤xg7 Јxg7. One had to include 36...Јe4+ 37.ўg1 Јd4+ 38.ўf1 Јxg7, if only to make the opponent nervous. 37.axb5 axb5 38.c3. White's position is still better. It is time for Judit to make mistakes, and Rustam finally converts the advantage tactically. 38...Јg6?! (38...¦f8) 39.f5 Јg7 40.¦e3 ¦a8 41.Јe1 Јf7 42.Јd1 Јg7 43.b4 h6 44.Јe1 ¦a7?! (44...¦g8 45.Јg3 Јf6 46.Јe5). 45.f6! Јxf6. Or 45...Јg6 46.¦e8+ ўh7 47.¦e7+ ¦xe7 48.fxe7 Јe8 49.Јe6 with a hopeless queen ending. 46.¦e8+ ўh7 47.Јb1+! 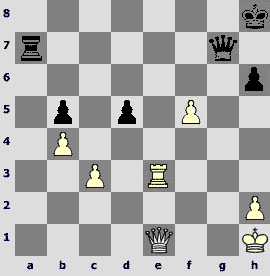 Black resigned, because of 47...ўg7 (47...Јg6 48.¦h8+) 48.Јg1+ Јg5 (48...ўf7 49.Јg8#) 49.Јxa7+. An elegant finish!